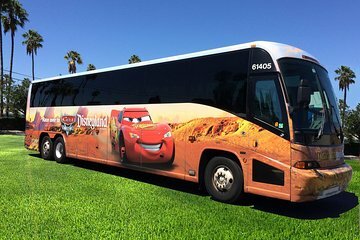 Regel uw vervoer met de Disneyland Resort Express, een transfer tussen Orange Wayne Airport en het Anaheim Resort Area. Sla de moeite van het huren, rijden en parkeren van een auto over met deze handige aankomst- en vertrektijdendienst, zodat u al uw vakantietijd kunt genieten van het genieten van de pretparken. Unfortunately what started as a great experience ended poorly. Our shuttle service from the airport to the hotel was great - on time and direct. The shuttle driver was friendly and professional. The return trip however was the exact opposite. To begin, the shuttle was 15 minutes late. Then after pulling in to two other hotels, which took another 10 minutes, we were told that we had to get off of the shuttle and other transportation would be arranged. No further explanation was given. We were also told that it would take between 20-30 minutes for the transportation to arrive. The "agent" in charge of arranging the new transportation was beyond rude and would provide no explanation as to why we were evicted from the original shuttle bus. The driver of the shuttle told us that she had to start her route to LAX and apologized. We couldn't wait the additional 30 minutes for the transportation to arrive so we were forced to take a taxi to the airport. Had I wanted to take a taxi, I would have arranged one from the beginning. This is the best way to get from the airport to the Disneyland Resort areas. The drivers are excellent and great at getting through traffic. Oh so EASY! Stepped off of Southwest and walked to the shuttle where is was just pulling up. Yippee! Dropped us off at the bus stop that was pretty much right there at our hotel - Tropicana Inn and Suites. The return trip was just as fantastic. Buses on schedule. Couldn't get any easier than that. This is our second time using the Disney resort shuttle and will continue to do so. Just a shame that you don't provide the Disney videos any longer. The kids always loved that. I was worried about leaving my car at the airport for my flight to Las Vegas and a friend recommended your services. I am so glad that I listened and booked the bus ride. My daughter dropped me off and I waited for a bit and the bus came. The driver helped me with my luggage and I decided to sit up front. I'm so glad I did. The driver was a very nice and funny man and we spoke all the way to the airport. He helped relax me because I was flying by myself. I will always keep your services in mind , especially now that I know they're available. Bus was on time, great customer service and comfortable ride. We waited about 10 minutes for the shuttle at the airport. Had a friendly bus driver who dropped us off at the bus stop a short walk from our hotel. We phoned during the week to book the trip back to the airport and were given a time slot. We were the only ones on the bus on the return trip. Painless. I would definitely book again. Also cheaper to fly in to and transfer from Santa Ana John Wayne airport if you are staying in the Anaheim area. Quicker transfer time too - traffic in LA is slow! Great, reliable service. Bus runs from airport roughly every hour.